The Bobcat, David LaBaume, decimated the catanacio defense of Pt. Townsend with 2 first half goals while the rest of the Wolves thwarted every Redskin chance and turned the tables on an early season loss. The best (and really only) chance the Redskins had came from Ross Bringgold in the 3rd minute when a cross from the left sent him in on Dain Steenberg. Steenberg was up for it and cut him off with a save to his left. Steenberg blocked the rebound in his finest moment so far this year, and the Wolves rallied. Sequim, utilizing a deep center forward, clinging to PT's deep center defender, shattered the impenetrable wall time after time, and save for a few mysterious refereeing decisions would have scored 5 or 6 goals. Kyle Brenske, starting in the deep forward position, had big centerback Rio Sabella tied in knots with tenacious tackling and didn't allow him any time to clear out effectively. Aided by equally tenacious Tyler Gilstrom, the Redskins began to crumble and turn the ball over. The turnovers were being pounced on by midfielders Jeffrey Catton and Greg Dunbar and one nearly led to a great goal by Brenske. Catton took an errant PT pass, slashed a cross in from the right that Austin Sanford met a step ahead of onrushing GK Jesse Yourish. Yourish undercut Sanford and the ball dropped to Brenske who buried it. The "offsides" call delayed the opening tally, which came on 26 minutes. Starting from his centerback position, "The Lightning", John Stansberry , jolted up the middle through the shocked Townsend midfield and sent a 60 amp bolt off to the left of LaBaume, just on for a tired Brenske. The Bobcat was off, dragging 3 defenders in his wake and lit the lamp with a nicky left footer, low and to the left of goalkeeper Jesse Yourish. Sequim continued the pressure and when Sanford was obstructed right before halftime, the Wolves were awarded a free kick at the 25 yd line. Sanford stood over the kick, and tapped it to the left. The silent thunder of the huge right paw of the Bobcat sent the ball sizzling into the right side twine and a 2-0 lead. If Yourish saw the ball, it was as it whistled past his ear. The second half was a clinic in attacking defense as Wolves didn't let the Redskins breathe. Stansberry, Keller Batson, Mason Harwell and Luke Shearer cleaned up every ball coming their way and more times than not began attacks that ended in danger. Kai Antrim, playing sparring minutes as he heals from an ankle injury, missed a breakaway after being sent in by Catton late in the game. Kevin Munro earned a penalty kick in the 70th minute after being dragged down in the box. Catton's uncharacteristic miss mattered not as the Redskins were unable to muster anything scary the rest of the way. So it's off to Silverdale next Saturday to play the #3 team from the Nisqually League in a winner to State match. Attack!! Check Back Here for Coachella Music Festival Reviews - Arctic Monkeys, Red Hot Chili Peppers, Ozomatli, Kaiser Chiefs, Sonic Youth, Rage Against the Machine and More!! "Play me at forward", was David LaBaume's response when coach Brasher asked him why fellow outside defender Luke Shearer had 4 goals and he had none. With leading scorer Kai Antrim sidelined with an ankle injury, LaBaume got his chance Tuesday and responded with 2 second half goals as the Wolves knocked off rival Port Angeles. Sequim, resting co-captain defenders John Stansberry and Shearer for the first half, started slow but finished strong as the RoughRiders were unable to pierce the makeshift Wolf defense. Kevin Munro, Austin Sanford, Keller Batson and Mason Harwell, along with goalkeeper Dain Steenberg, Stansberry and Shearer combined to limit the 'Riders to only a handful of decent chances. The closest was a ball that caromed off the right post 3 minutes before halftime. Meanwhile, the Wolves turned up the heat in the second half, getting the opening tally and game-winner through Camilo Tejeiro at 50 minutes. Shearer began the play from the left back, working a give and go with Sanford. Luke zipped the ball central to Tyler Gilstrom who spied Tejeiro coming in from the left. Camilo gathered it in, blasted a direct shot that was deflected and calmly slotted home the rebound. A similar play led to LaBaumes first goal on 60 minutes. Shearer again started things, this time seeing Michael McNulty in the middle. McNulty set the table for LaBaume, coming in from the left and his low, hard drive found the right corner and a 2-0 lead. Jose Najera was the server of the last goal, setting LaBaume free down the left with a daft little backheel. LaBaume's finish was again clinical, down low and hard, giving Levi Fahrenholtz no chance in the PA goal. The Wolves now have a couple days rest before heading off to Kitsap county on Friday and Saturday for ties with Klahowya and North Kitsap. Luke Shearer's opening stunner was all the Wolves could muster against the top team in the Olympic League on Thursday. Shearer made a great run from out of the left defensive end and was spotted by Jeffrey Catton streaking up the side. Shearer took it at the 25 yd mark, cut inside, bamboozled 2 Trojan defenders and stuffed a right footed dart into the back of the net. Perhaps it was the ease of that 3rd minute goal, or the the lazy spring sunshine, or the slight twist of an ankle or something else that was the reason. Whatever the cause, the Wolves packed up camp and proceeded to play some uninspired soccer for the remainder of the first half. 4 minutes after Shearer's salvo, Cody Clark, the Trojans top scorer, slid through the center of the Wolf defense collected a poor clearance and found himself 1 on 1 with right back David LaBaume. LaBaume was unable to put the clamps on Clark and he slotted a shot from the left side into the right corner and a 1-1 tie. At the 30 minute mark, midfielder Matt Clarke took the ball near the Wolf 30 yard line, slid lazily across the middle and let go a rolling lead balloon that had eyes for the right corner. After the ball had been traveling for what seemed like 10 minutes, it eluded a prone Dain Steenberg in the Sequim goal and nestled into the back of the net . The second half brought some better action from the Wolves but the Trojans defense was ready. Greg Dunbar rammed a couple headers over the top off nice looking corner kicks and LaBaume looked to have the equalizer late in the game only to be mauled at the far post causing him to push the ball wide. The Wolves will regroup and head to Port Angeles next week to try and get healthy on the Roughriders. The Wolves slipped down to Bremerton Tuesday for a second round battle against the new-look Knights. With 4 players back from ineligibility, the Knights looked much quicker and sharper than in the first round tilt in March. The Knight's pitch was also in sharp shape, manicured like the fairways of Augusta. Sequim was ready though, and started nicely with Kevin Munro, Jeffrey Catton and Luke Shearer setting up chances from Kai Antrim in the 3rd, 8th and 15th minutes. Antrim was just off and couldn't get the opener. That came on 20 minutes when Antrim found Catton popping through the middle and Catton's blast from the left parried off the Knight goalkeeper where Austin Sanford collected it and sent it home. Sanford's goal was the first by a Sequim freshman since Casey Nagler in 2001. The Knights countered and had a header go just over in the 23rd minute and right before halftime had a great chance. Slicing through the Sequim defenders like the Elwha through Goblin's Gate, Travis Cameron found an opening and fired a blast labeled for the upper corner. Dain Steenberg, in the Sequim net, got a big right paw on it and tipped it over to preserve the lead. A spirited halftime discussion led by Antrim and John Stansberry brought the Wolves out hungry in the second period and on 49 minutes they got the second tally. Antrim was set free down the left side by Catton and Kai sent in a buttery cross that was met at the far post by a steaming Kevin Munro. Munro got his noggin on it, driving it past the Knight keeper and a 2-0 lead. The Wolves continued the attack as Antrim broke his 2 game scoreless streak. Catton again set the plate with a searching ball over the Knight defenders, where Kai took it, dribbled the keeper and finished cleanly. Catton got his due in the 67th minute, when David LaBaume sent in a long corner kick that Jeffery headed on to Antrim on the far right. Antrim drove in a shot that Catton re-directed into the back of the net and a 4-0 lead. The Wolves coasted home from there, with second half goalkeeper Kyle Brenske maintaining the shutout with 2 fine saves on a last gasp Knight attack late in the game. Up next is a battle with Olympic on Thursday in Sequim. One game ahead of the Wolves, the Trojans will hope to stay there. “I don’t want to hear how we played hard and it was a nice game”, Coach Brasher was thinking as the clock wound down and the Wolves had given up a 1-0 lead and were now down 2-1. The undefeated Seahawks from Peninsula were on the verge of continuing their streak and the Wolves were staring at 2 consecutive close losses when the “Gilly Jig” happened. There were 2 minutes left in regulation time. Left back Luke Shearer, who had riled up the rest of his team with a verbal tirade after Peninsula’s second goal, had abandoned his left back slot and was chasing down a loose ball deep in the right corner of the Peninsula end. Shearer won the ball, cut it in along the end line and crossed a low drive in to Tyler Gilstrom in front of the net. Gilstrom received the ball and performed what can best be described as a jig while the ball lay at his feet. The jig mesmerized goalkeeper Alex Baebler and Gilly poked the ball in the back of the net with the outside of his right boot. The “Gilly Jig” had knotted the score and sent the game into overtime. Shearer had opened the scoring in the 28th minute on a lazy floating 30 yard left footer off a quick throw-in from Jose Najera. It eluded Baebler in the Seahawk net who looked like French keeper Fabien Bartez (Bartez is known to keep a boda-bag of wine in the back of his net). The Wolves knew the 1-0 halftime lead would not be enough, and sure as Hillary Clinton will be the next President (? ), the Seahawks equalized on a rippin’ left foot blast from Freshman Jesse Rohwer on 44 minutes. Sequim goalkeeper Dain Steenberg made a great sliding save 2 minutes later to keep the score tied and Kai Antrim missed a chance to put the Wolves back on top at the 53 minute mark, ripping a Greg Dunbar flick pass over the top. The Seahawks gained the lead on 68 minutes when little Joel Myers stole the ball from David LaBaume in the left corner of the Sequim end and zipped a cross in that found 2 wide open Seahawks. Aaron Chidester headed home the serve for the lead that set the stage for the Jig. The Golden Goal OT was not the time to play for a tie and Sequim attacked with LaBaume moving forward and John Stansberry, Kellar Batson and Shearer anchoring the back. The first 5 minutes ended scoreless and the Wolves continued to press in the second 5. Antrim's hard work in the right corner led to a corner kick with 2 minutes remaining. LaBaume, taking the kick for an exhausted Jeff Catton, lofted a sweet curling ball in to the mixer. Greg Dunbar, who had been an under-appreciated midfield warrior all game, rose high and smashed a stiletto through the Seahawks’ heart and the victory. Everything from the 70's isn't so bad. The Port Townsend Redskins have dusted off the Italian "catanacio" style of play from the 70's and are showing the Olympic League how it can be effective. "Catanacio" - literally translated to mean "boring defensive soccer" was effective for the Italians when they stalled more talented teams with furious defensive and then prayed for one break to give them a chance. The Redskins thwarted 20 Sequim scoring chances over 88 minutes and then got their break with 2 minutes to go in the second overtime period to pull out the 1-0 win. Sequim dominated the first half with great chances from Jeff Catton on a 28 yard free kick and and a Greg Dunbar header off a corner kick. But the Redskins were solid as goalkeeper Jesse Yourish and big centerback Rio Sabella came through each time. Forward Kai Antrim was held in check by the Redskins limiting him to only 4 chances on goal, while the Sequim defense was limiting the anemic PT attack to a combined total of 3 shots. The second half was a bit more even as Antrim missed a breakaway and Camilo Tejeiro hit the post, while Sequim goalkeeper Kyle Brenske made two nice saves in the dying minutes of regulation on the Redskins' two best chances. A Choir Concert and a Mexico trip left the Wolves 6 players short heading into Belfair and a showdown with the Bulldogs from North Mason Thursday night. Starters Greg Dunbar, Kevin Munro and Keller Batson had singing commitments so John Textor, Zane Carey and Tony Breen got the call-up from JV. Kai Antrim didn't seem to mind the makeshift lineup as he and Camilo Tejeiro hooked up on a nice give-n-go session for the opening goal after 4 minutes. Jose Najera racked up some fruitful minutes and served up Antrim with a sugary feed 15 minutes later that Kai finished with sweet left foot finish and a 2-0 lead. Textor also logged some nice playing time and worked hard as the big center forward target. The Bulldogs tried again and again to press straight through the Wolf defense but John Stansberry and Batson fill-in Mason Harwell were up to the task, denying Francisco Santiago multiple times. The outcome was never really in doubt, as the Wolves controlled most of the play with Jeffrey Catton and Tajeiro buttoning down the central midfield and Luke Shearer and David LaBaume controlling the flanks. 4-1-1 record and Antrim and Catton with 10 and 7 goals respectively. Kai Antrim and Jeff Catton continued their scoring tear as each had hat tricks as the Wolves clobbered the overmatched Eagles from Klahowya. Antrim has 8 goals for the year while Catton is right behind at 7. Luke Shearer also scored on a rippin' shot and had 3 assists. Shearer leads the Wolves with 6 assists. Antrim opened the scoring on 4 minutes after Shearer lofted a beautiful cross-field rainbow to a streaking Kevin Munro in the right corner. Munro collected the ball and sent a cross into the box that Kai finished. The winless Eagles decided to hang around for a while and equalized on a great individual effort (and mercifully shabby Wolf defense) by Darryn Reinertson at the 15 minute mark. Midway through the half, Catton decided to pump the Wolf accelerator and headed home a great cross from Shearer and a 2-1 lead. Catton then drove a mean corner kick into the league of onrushing attackers and big David LaBaume managed to "Baylon" a flick to the far post. Antrim was there to clean up and the Wolves were off to the races. Luke's blast at 34 minutes and Catton's second off an Antrim assist 2 minutes later, sent Sequim into the half with a 5-1 advantage. The Eagles were gasping in the second half, playing without any subs, and Catton and Antrim finished off their hat tricks at 64 and 72 minutes. Kai's finalé was a beauty - a 27 yard missile, launched from straight on. Kyle Brenske, playing in his first varsity match, notched the 8th and final off an assist from Tyler Gilstrom. The Wolves continue testing the 2A schools this week with an away match at North Mason on Thursday. Kai Antrim and Greg Dunbar each had a goal as the Wolves knocked off previously undefeated Port Angeles 2-1 in a battle of North Olympic Peninsula rivals. The game was not pretty but the Wolves hung tough against the powerful but raw RoughRiders. Antrim took a beautiful knifing through-ball from left defender Luke Shearer on 15 minutes, sliced in from the right, beat Garrett Snell the PA central defender and pounded the ball past Levi Fahrenholtz for the opening tally. It looked like the lead might double minutes later, but Fahrenholtz came out strong and stopped Kai's second jaunt in past a game PA defense. The Wolf defense decided to be charitable at the 19 minute mark, as goalkeeper Dain Steenberg took a back pass from Jeff Catton tried to dribble a bit and had a little trouble. John Stansberry tried to help, but Tyler Owen stuck a foot in and poked a shot in the open net and a 1-1 tie. The Wolf defense stiffened the rest of the way with Keller Batson and Stansberry in the middle, along with defensive midfielder Greg Dunbar winning many of the PA long-ball attempts. Dunbar got the winner at the 53 minute mark, heading in a money corner kick from Catton. The last few minutes were a bit tense as the 'Riders hit the crossbar on a corner and Antrim hit the post on the other end to deny the Wolves the 2-goal cushion. The Wolves now prepare for the Olympic League's 2A schools after going 2-1-1 against the 3A's. In a classic battle of "Who Cares About Defense? ", the visiting Wolves could not hold on to the lead and settled for a 4-4 tie against the Trojans from Olympic. The Wolves had four stunning goals and attacked with power and grace while defending like the French. Jeffrey Catton had his shooting boots on and lit the lamp in the 15th minute with a tungsten dagger from a 28 yard free kick. The lead lasted 13 minutes when an unlikely angled Trojan free kick from the right edge of the penalty box squirted through to knot the score at 1. Sequim regained the lead on 35 minutes when Luke Shearer forayed into Trojan territory down the left and sent a driven cross toward the penalty spot. Kai Antrim, on a gallop in from the right met the ball in stride at the 12 and headed it to the upper left corner for the 2-1 lead. 30 seconds before halftime (Aaaaaa-rrg! ),the Trojans equalized again with a well placed 25 yd shot that just eluded the fingertips of Sequim's Goalkeeper Dain Steenberg. Olympic took their first lead of the game on 44 minutes, following a defensive miscue deep in the Sequim zone. The turnover sent Cody Clark in alone on Steenberg and Clark buried it to the right of the isolated Sequim keeper. The Wolves did not fold up the tent and instead went on a tear with some of the nicest build-up attack seen in a while. The equalizer came on 50 minutes with Shearer again making an incursion down the left. With a Trojan approaching him just past midfield, Luke poked a pass to Austin Sanford who deftly returned it down the line as the run continued. Shearer then put it to the corner where Antrim was motoring. Kai gathered in, turned and cranked a sweet left-footed cross into the mixer, where Catton met it on a volley and watched it nestle into the yarn. The barrage continued as Shearer yet again set forth into the Trojan end, this time taking it himself and blasting a low screamer that found its way to the target and a 4-3 Wolf lead. Antrim broke free minutes later and just missed as the onrushing keeper rattled Kai's shin and sent him to the sidelines to shake it off. The ensuing Olympic rush earned a corner kick on 70 minutes and with Antrim on the bench, his far post defensive position was unmanned and David Meherg filled it and nodded it past Steenberg to square things at 4. That's where it ended as the play turned frantic and nothing nice developed. The 2 extra periods produced one fine save from Steenberg and a near miss from Sanford for the Wolves. 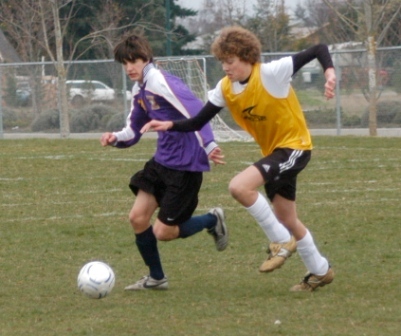 It was nice to leave Silverdale with a point, but three would have been sweet..
25 former Sequim players plus a few soccer junkies showed up Saturday afternoon to test the 2007 version of the JV and Varsity Boys Soccer team. Split into 2 teams by veteran Skipper Kevin Magner, the pre-1998 team and post-1998 team both showed spurts of brilliance followed by flashes of ineptitude. The "Really old and fat dudes" tied the JV 1-1 and lost to the Varsity 2-0. The "Old and fat dudes" beat the JV 2-0 and tied the Varsity 0-0. Magner was quoted as saying, "It's a wonder I ever won a game in my tenure with these guys. ", to which ex-player Powell Jones responded, "I don't think you ever did win a game." Sam Watson (1999) took Sophomore David LaBaume apart with slashing runs down the left side. (Watson paid me $5 to write that). A historic moment occurred in the second half when the father-son combination of Marcus and Jireh Sanford bore down the right flank attacking young freshman son and brother Austin Sanford. The attack ended with Marcus's ballcap twisted sideways and him calling for help from younger son, 11-year old Lijeh. In the end, no injuries were reported but they'll be some sore, limping old-dudes for the next week or so. In the home opener, the Wolves got their first Win of 2007 with a 5-0 trouncing of Bremerton. Jeff Catton had a pair of assists and a goal while Kai Antrim netted 2 tallies. Bremerton lead scorer, Francisco Garcia, was held in check by central defenders John Stansberry and Keller Batson as the Wolves dominated the Knights throughout the game. Antrim opened the scoring in the 2nd minute of the game, converting a nice through-pass from Mason Harwell with a clinical finish low and to the keepers left. On 16 minutes, Camilo Tejeiras scored his first goal as a Wolf, finishing off a 35 yard free-kick from Catton. 10 minutes from half, Catton rifled a low screaming 20 yd shot through the Knight keeper after being assisted from Stansberry on a free-kick touch. Antrim finished the first half barrage on 34 minutes blasting through a misplay by the Knight keeper. Five (5) set-play goals and a late breakaway tally gave the host Peninsula Seahawks a convincing 6-0 victory over the visiting Wolves. Cameron Figliola’s long flip-throw-ins gave the young Wolf defenders fits and led to 2 uncontested goals, 1 in each half. A 35 yd free kick and free-header finish by Matt Johnson opened the scoring on 10 minutes. The open field play was nearly even in the 1st half as Kai Antrim caused a few problems for the Seahawk defense but could not convert. Two penalty kicks, one from a John Stansberry slide tackle at the 18 minute mark, and the second resulting from a Michael McNulty hack in the 63rd minute, added to Sequim’s misery. Figliola converted both, although goalkeeper Dain Steenberg felt he should have stopped the first one. Sequim’s defensive tackling and high-ball challenges were glaring weaknesses and it was nice to have them exposed early in the season. Luke Shearer had a couple bright shots on goal that could easily have gone in with a centimeter variation in elevation. Jeffery Catton was the lone defensive stand-out with outstanding determination and tackling. Seahawk coach Terry Stebner wondered after the game “who are the strong teams in the Olympic League?” Hopefully he caught one of them on an off night that can prove itself in the April re-match. The Wolves nearly defeated the rough & tumble 'Riders from down the road, save for a questionable penalty kick awarded early in the 2nd half. The Wolves were classier and worked hard to showcase their passing game in the sandy soup that was Civic Field in Port Angeles. An early lapse on a PA corner kick in the 5th minute gave the green & gold and early 1-0 lead. 10 minutes later, Jeffrey Catton mis-hit a long 40 yard free kick sending it floating toward the end line. A backpeddaling Levi Fahrenholtz, PA goaldeeper, could only swat at the air as the ball somehow found the upper left corner to equalize at 1-1. Kai Antrim was set free on a beautiful feed from Greg Dunbar in the 30th minute and made no mistake slotting it past Fahrenholtz and a 2-1 Sequim lead. Wolf defender, David LaBaume, was whistled with a charging foul on 44 minutes that led to a Jay Kang PK and the final 2-2 score. Luke Shearer made numerous forays into the PA zone only to have the field deny him of several brilliant crosses. Shearer should have brought his sand-wedge in order to chip out of the hazards down the left side. Dain Steenberg, getting his first Varsity start for the Wolves, played solid between the sticks. Catton and senior John Stansberry also had decent opening game performances for Sequim. The League opens Tuesday with powerhouse Peninsula hosting the Wolves. Here We Go!! 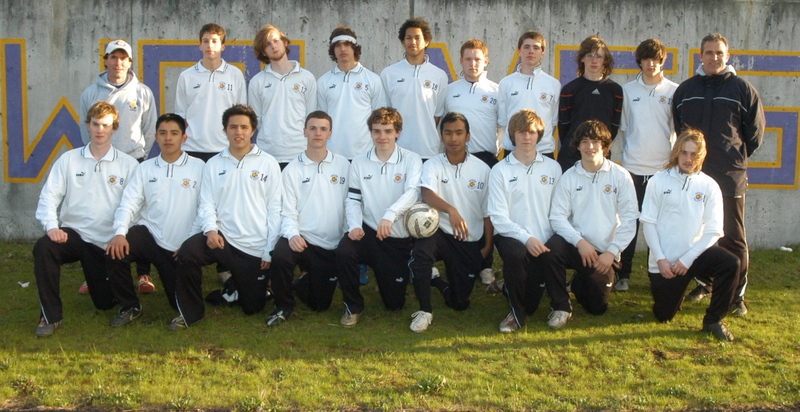 Record last year/place in league: 10-5-1, 9-1 League, 2nd Place Nisqually League, Lost to Hazen in WCD 1st round play-off. What can fans expect from your squad this year? This year’s team is a relative unknown. The core players have been working together for a few years and could blossom into something special. Kai Antrim, returning 1st team Nisqually League selection, will find the competition stiffer in the new Olympic League. The outside attack of Jeffery Catton, Luke Shearer and the enigma John Stansberry will determine whether the Wolves can confuse opponents. Greg Dunbar and David LaBaume give the Wolves size and beauty or is it strength and ugliness? The unfolding season will answer that. How will your team do against the rest of the league this year? Big Rivals? Key dates in the season? The Olympic League will bring new challenges in Olympic and Peninsula. Traditional powerhouses, the Wolves are excited to test their growth against these schools. Pt. Angeles and Pt. Townsend will be local rivals and should bring out the best in us.